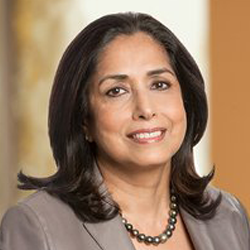 Kalpana Raina is Managing Partner of 252 Solutions, LLC, an advisory firm that specializes in strategic development and implementation. Her current focus is the Social Enterprise sector in Asia with co-investments in selected transactions. A banker for twenty years, she has considerable industry experience in both traditional and digital media, information and entertainment services, telecommunications and the financial services industry. She was previously Executive Vice President and Head of European Country Management and Corporate Banking at The Bank of New York. Kalpana’s board tenures have all involved dynamic strategic shifts to new technologies, content creation and delivery systems, as old business models have been disrupted. Kalpana holds director positions at John Wiley & Son, Yellow Pages Limited, Information Services Group Inc., The World Policy Institute (WPI) and STA Consulting. She is also currently a member of the International Advisory Board of ODX, Women Corporate Directors and The National Association of Corporate Directors. She holds a B.A. degree Honors degree from the Panjab University, India and an M.A. degree in English Literature from McMaster University.